Governor Baker's 2017 budget provides a positive start for persons with intellectual and developmental disabilities. Most noteworthy are DDS funding gains in Family Support ($5 Mil increase), Employment ($12 Mil) and Community Residential ($25 Mil) accounts. The latter two account increases are a mix of new dollars and to maintain 2016 spending in areas such as Turning 22. 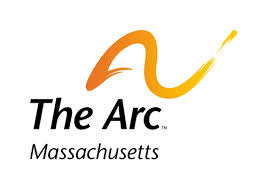 The Arc will work with partners to increase allocations to fully fund services for those Turning 22 in employment, autism omnibus and other areas.Additionally The Arc with partners in "SupportingFamilies.org" is pushing for a $100 Million investment over 4 years for 5700 families in high need in the areas of Family Support, DESE-DDS and Autism Children's Waiver. The Arc's Operation House Call goes Prime Time! WBZ TV's Paula Ebben will highlight The Arc's Operation House Call. The segment is tentatively scheduled to air on the 5:00 news on channel 5, Monday February 1, 2016. The segment will include an interview with the Dollar family; as well as two medical students. OHC is a growing training program for medical students and other health professionals. The classroom and hands on learning focuses on the unique health care needs of individuals with autism or intellectual and developmental disabilities and their families. The premise is that families make excellent teachers. On Saturday, March 12 from 9 am-5pm Vinfen will hold its 9th Annual Moving Images Film Festival. 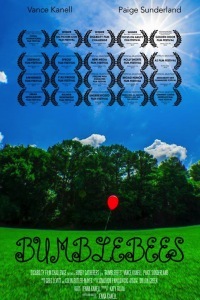 The event, held at the Joseph B. Martin Conference Center at Harvard Medical School, features films including Autism in Love, Bumblebees, Guest Room, and Love & Mercy; which are followed by interactive and educational panel discussions comprised of the stars from the films; experts in psychiatry, medicine, and nursing; and people with disabilities, their families and caregivers. CART Interpreter Services will be provided for panel discussions. Lunch will be served and parking at the venue is complimentary. Due to this year's theme, the Vinfen 2016 Moving Images Film Festival will be PG-13. The event is free and open to the public, but a donation of $5 is suggested and appreciated. Donations can be made online or at the event. 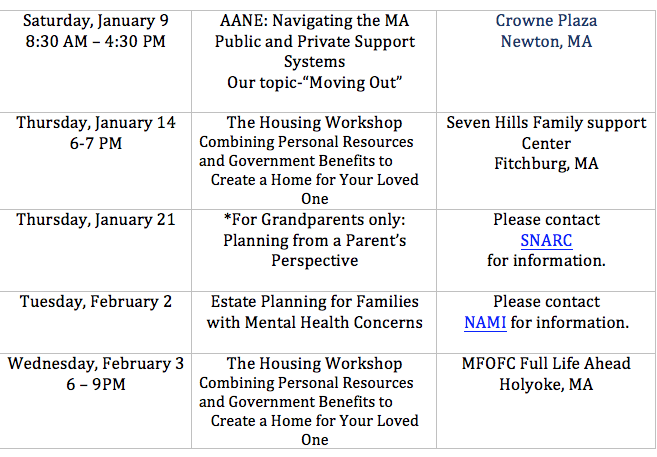 The Massachusetts Families Organizing for Change (MFOFC) Family Leadership Series focuses on supporting families and individuals to live in their communities as naturally and typically as desired. Applications from families with children or adult family members of any age with any disability who are Department of Developmental Services eligible are encouraged. Applications for the Central Region due no later than Monday, January 11, 2016. The first weekend begins Friday, January 22. Click here to download the MFOFC Central Region FLS application. Spaces filling up fast for the MFOFC Northeast & Metro Boston Region FLS -- The first weekend begins Friday, January 29. Click here to download the MFOFC Northeast and Metro Boston application. Diary of a Dream : Creating a Full Life. There has been a lot of positive change enacted over the years to provide access to quality health care, education, and increased options for individuals with special needs. However, a lot more needs to happen until people with disabilities are truly valued members of our society. I think of all James has taught me and our family about patience, kindness, hugs and love. As his mother my role is to listen to him and, even though he doesn’t speak in the typical ways, acknowledge and respect him. I know he must be taught to advocate for himself while encouraging and teaching those around him to listen with their hearts as well as their heads. I spent much of the early years with James in a constant quest for good information. 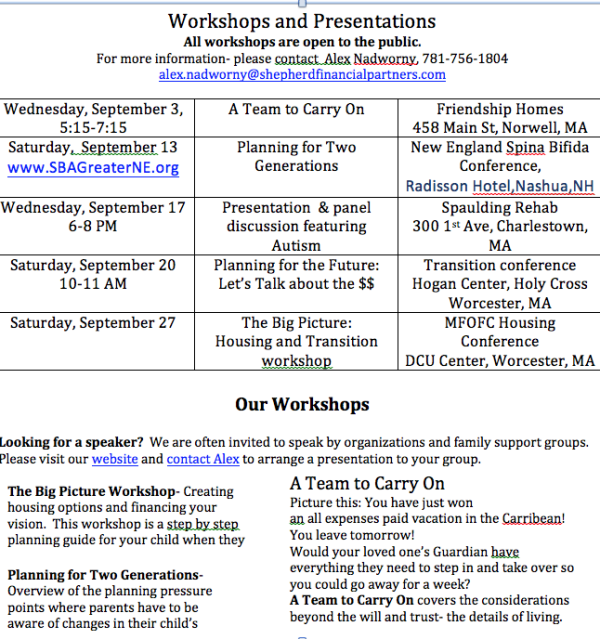 The best training I ever attended was the Massachusetts Families Organizing for Change leadership series (www.mfofc.org). James had a couple of extremely rough years, having been diagnosed with infantile spasms, a particularly challenging type of seizure disorder. He was found to be eligible for respite services through a state agency and they allotted hours of nursing care to him and then suddenly, the hours were cut. John requested an organizational chart to figure out who within that agency was in charge of our family. It was then that we found out about the leadership series through an incredible advocate within the Department of Developmental Services. Our amazing advocate, Judy Curry, encouraged us to attend the leadership series in Southeastern MA to help us understand the system. It took a tremendous effort to attend the training sessions- they required a commitment of six full days and overnight stays- but we were thrilled with the opportunity. The Department of Developmental Services paid for the training but we needed to find people to care for James and our other children. My friends and a few paid people did two of the weekends and family came in from out of state to cover the remaining weekend enabling us to take this giant step forward for our family. The leadership series gave John and me inspiration, as well as the determination, to achieve a great life for James. We were introduced to other wonderful families dedicated to the same goal. The training focused on providing an overview of how we could make a difference and how to determine what is worth fighting for. It helped us develop a vision and define our values, which gave tremendous clarity and focus about what was most important for James and our family. Lastly, appreciating how the legislative process works and why we need to be active participants in order to impact not only James’ life but to make the world a better place for all. Getting our priorities right at that early junction helped us seek out opportunities and confidence to speak up and out when needed. With assistance from Judy Curry and Walter Bacigalupo, I was able to bring the MFOFC Leadership Series to the northeast. I am always mindful of a wonderful man I met in this first series who was a widower living with his adult daughter. He told me about his nightmare of not being able to “settle “ his daughter into a supported living arrangement before he died. He hadn’t put anything into place when shortly after the series ended, he died quietly in his armchair. We started planning the first Housing conference shortly thereafter in 1996. This man’s nightmare broke my heart and became a focus for planning for James and others so this wouldn’t happen to anyone else if we could help it. View the Special Needs Financial Planning upcoming workshops here. Happy 2016 and warm wishes for a joyous new year to all of our friends, colleagues and followers. Our educational outreach schedule covers a number of topics -- we hope to see you in attendance! Please feel free to reach out to Alex with any questions or requests. All workshops are open to the public, except where noted. Looking for a speaker? We are often invited to speak by organizations and family support groups. Our appearances are always pro-bono however there may be a fee to attend a conference. Appearances with an * are for specified audiences only. Please visit our website and contact Alex to arrange a presentation to your group. Here are some of our favorite stories featuring creative employment opportuniites. Mozzeria: A Small Business Revolution Mini-Documentary from The Small Business Revolution on Vimeo. The Courtyard Muncie at Horizon Convention Center in Indiana opens this month and is profiled in this story from Yahoo. This hotel will function as a traditional hotel as well as housing a training center where people with special needs will study to learn the hospitality industry and serve as interns. Read more here. 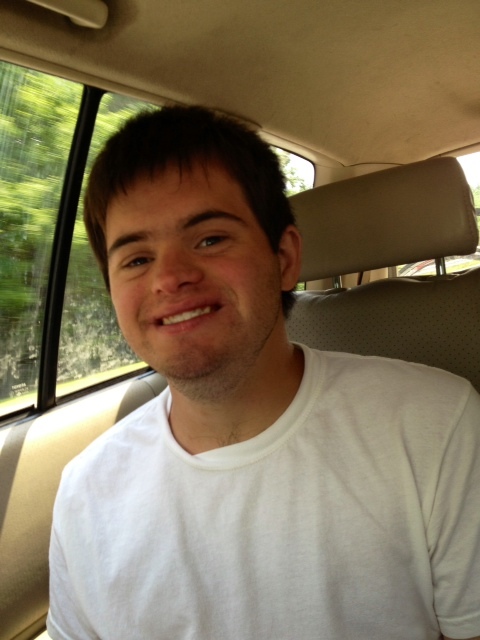 The A & E network has premiered a docu-series called Born this Way which follows the lives of seven young adults with down syndrome and their families and friends in Southern California.Check out this clip of Sean's new job! HUD Announces $150 Million in Rental Assistance Grants to Expand Housing Options for People With Disabilities; Massachusetts to receive $6.8 million to help 100 households. Recently, the U.S. Department of Housing and Urban Development (HUD) awarded $150 million in Section 811 Project Rental Assistance funding to help low-income people with disabilities remain in community settings and avoid homelessness. Quality, accessible, affordable housing is essential for people with disabilities receiving long-term services and supports in community settings. This program is the result of a partnership between HUD and the U.S. Department of Health and Human Services (HHS). Read the HUD announcement and list of states receiving funding. 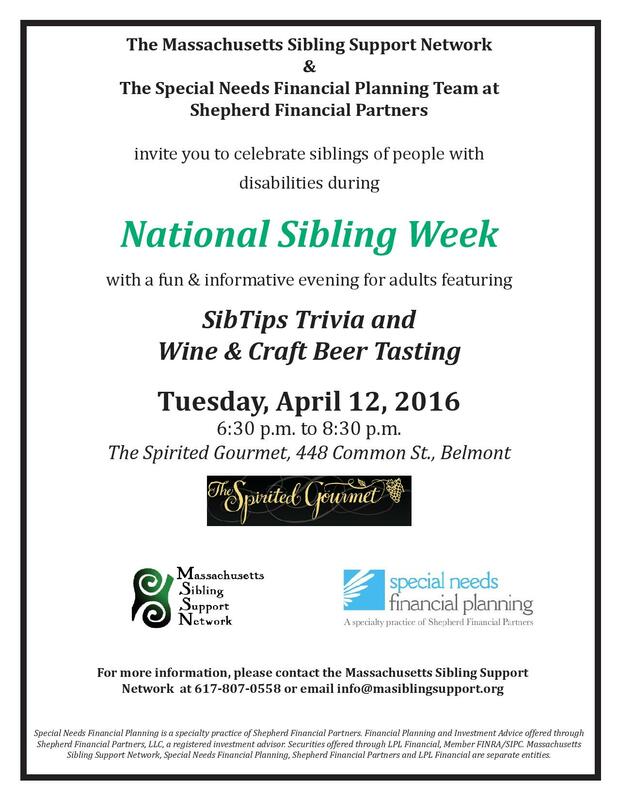 Presented on behalf of the MA Sibling Support Network by Cynthia Haddad. Sponsored by SEPAC - Please attend if you are available- No RSVP needed. 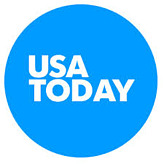 We are featured in USA Today! John and Cindy are quoted in this article, Protecting Special Needs Kids Financially. Read the article here.